They echoed whispers of love from an era gone by. Seventy-two handwritten letters, hidden in the closet, stuffed in a shoe box, and locked in her heart. They held the aroma of romance, the sounds of war, and the pain of separation. Who knew she kept these treasures of her heart after all these years? Ann Jean “A.J.” Mitchell slipped into eternity on March 28, 2002. 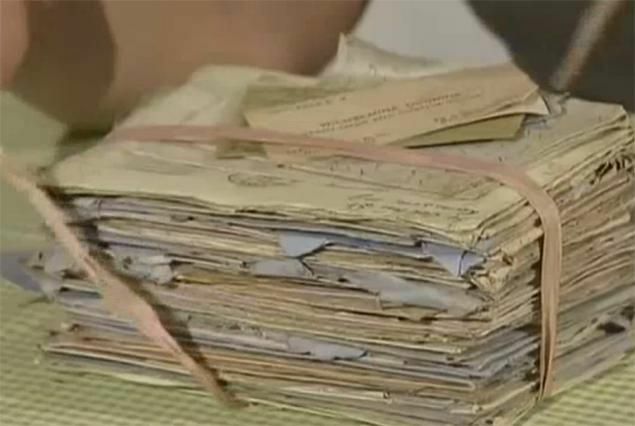 Of all the earthly belongings left behind by this wife, mother, and grandmother, the most treasured were these letters. Sylvester Chris Mitchell, lovingly known as Mitch, wrote them. He captured her heart more than 60 years before and never let go. Three years earlier, she was forced to let him go. For the first time in 53 years, a heart attack separated them. Death became the final separator, but the war came first. These letters told that story. Like it had for millions of other young lovers, World War II tore A.J. and Mitch apart. The letters he wrote from the front lines latched their hearts together while the winds of war swept over the earth in the 1940s. Jean found them first. Then, she showed them to Kevin, Brian, and Chris. Those four children of Mitch and A.J. were the fruit of their love and pride of their lives. For the four, the letters revealed a little known chapter in the lives of Mom and Dad. They also uncovered a side of Dad they never knew. Who knew he could be so romantic? Kevin exclaimed, “Who is this guy?” Mitch certainly was a loving, faithful husband, but they never knew he was such a romantic. Children don’t always see this romantic side of their Mom and Dad. The letters themselves became a chronicle of the war and a testament of their love. They began in North Africa. May 8th, 1943 was the first letter. Mitch had just survived the gauntlet of the Atlantic where German U-boats regularly sunk Allied shipping. The successful Allied campaign to free North Africa from the grip of German and Italian troops had just ended, but Mitch’s war had just begun. Arrived safely somewhere in North Africa. When this messed up world settles down I will be able to tell you in the fullest detail the episodes of my travels. … From what I have seen of these North African Cities or in fact any of the places where I have been I am left with the feeling of appreciation that I come from the good old U.S.A. … I am writing this letter from our new camp, which is located on the side of a hill overlooking a large vineyard grove. We just received the good news that the African campaign has come to a successful conclusion. I was in town this afternoon where I enjoyed a few beers in a beer garden located on the sidewalk. While in town I ran into some friends from my old outfit. This morning I changed all my American money into this exchange. Now I have so much paper money that I could wallpaper two large rooms. All we can buy with it is wine and beer and a few other unessentials. How about seeing you in New York this coming week-end? I could really go for a good steak. But I would rather see you. Well AJ I will close hoping I receive a letter from you soon. Mitch addressed the letters to Miss Ann Jean Manning, 10 Bullard St., Dorchester, Mass. (No zip codes in 1943.) He postmarked them from Lt. S.C. (Sylvester Chris) Mitchell, APO (Army Post Office) 3792, Co H, 54th Med. Bn. Mitch served in the Medical Administrative Corps. Trained as a food chemist, he graduated from Officer Candidate School at Camp Barkeley, Texas, on October 17th, 1942. Now, he was trained for setting up field hospitals just behind the front lines and treating the inevitable casualties of war. Since his first letter from North Africa, he had two months to prepare himself for the Allies next major offensive, Operation Husky, the invasion of Sicily. On July 10th, Mitch along with 160,000 Allied troops took part in Operation Husky. Forty days after the invasion, he wrote his first letter from Sicily. Please excuse the very long delay in writing to you. This delay is in no way an indication of lapse of memory, for you have been on my mind from one night in Boston. Since I have put foot on this Island I have been so busy, only getting a few hours sleep in 24 hours that letter writing was really impossible. I landed on D-Day, which means the 1st day, July 10th about ten miles east of Gela. Tomorrow I will write you a long letter about my trip from North Africa. In my travels thru this mountainous Island I brought you a present which I will mail when I get back to the Co. I have been away from the Co. for the last few days. So much has happened and it is still forbidden to tell all that it makes letter writing very difficult. Ann I will close this short note as I am very tired for I have traveled 125 miles over these rough mountainous roads today. Mitch survived the campaign to win Sicily. But he was still fighting the campaign to win A.J.’s heart. In the meantime, he had another battle to fight, malaria. Just received your letter of Sept. 16, which increased my morale greatly. Please excuse the writing as I am still in a horizontal position in bed. I was out of the hospital for five days but was forced to return when my malaria reoccurred. I am feeling fine now and am sure this present treatment will rid me of this – malaria. I would love to be with you and prove to you that you aren’t suffering from any delusions. If my letters have failed to convey that I do miss you and are constantly thinking of you I am sorry. Most of my letters are always cut and dry. You will notice that my APO# has been changed to 464. While in the hospital I received your package of Yardley’s soap, which is quite a rarity over here. Thanks for the package. Send some snapshots of yourself in your next letter. I would love to see the movie roll we took in New York, my sister said it was good. Today the weather is perfect for a football game. Someday we will be able to see some good game together. Will close honey for now. Mitch spent more than a month in the hospital. Doctors released him in late November. He went down to a 120 pounds, but survived his bout with malaria and the battle for Sicily. Next, the war would take him to Italy and into the long night of the bloody Italian campaign. His letters went on too as did his love for A.J. To read more letters between AJ and Mitch follow link below. Explore Normandy landing exhibits, letters, maps, and more! That’s unbelievably sad. 15 years? That explains alot. They do not teach it anymore, my kids don’t know how to write it. It stopped about 15 years ago. Love letters are so lost now. Within a generation grandkids will grow up and never know the romance their parents or grandparents my have experienced. There will be no trace since it is all electronic now. History is slowly being lost. Sad day.